Sus Corazon is part of a multidisciplinary research group called ‘Nature, Health & Design at the Department of Geosciences and Natural Resource Management. She is involved within a wide range of current research trends on interactions between man, human health and the natural environment. 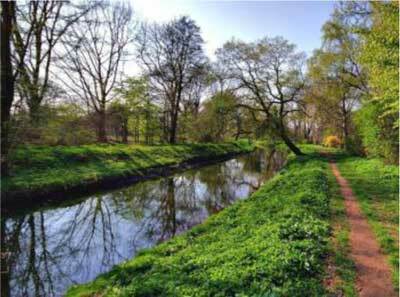 There is growing evidence of the health benefits of visiting green spaces. However, research indicates that individuals with mobility disabilities visit green spaces less frequently than the able-bodied population. The aim of this study was to examine the experiences and related constraints of individuals with mobility disabilities visiting green spaces. The study’s qualitative research design employed group and individual interviews, which were analysed using interpretative phenomenological analysis and social geographical theory. The results indicate that, generally speaking, the interviewees valued green spaces highly. The serenity of and possibility for close physical contact with a green space were preferred and promoted experiences of insideness and identification with the space. Conversely, lack of accessibility led to feelings of exclusion and outsideness. To increase both the accessibility and positive experience of any green space, it is advisable to include the user group in the study design process. There is an increased awareness of health risks related to urbanisation and the sedentary lifestyle of the modern age, leading to urban green spaces becoming recognized as a resource in public health promotion (Annerstedt van den Bosch et al. 2016). Research into the health benefits of visiting green spaces has increased substantially over the past 30–40 years (WHO 2016). The reported health benefits span from eliciting a positive mood (McMahan & Estes 2015), restoring attention capacity (Ohly et al. 2016), and lowering psycho-physiological stress (Berto 2014), as well as providing opportunities for physical activity (Thompson et al. 2011) and stimulating social cohesion (Hartig et al. 2011; WHO 2016). In Denmark, where this study took place, there is a strong public awareness around the importance of visiting green spaces. This is evidenced in the frequent use of green spaces by Danes: a national representative survey found that 43 percent of the respondents reported visiting green spaces on a daily basis and 91 percent at least once a week (Schipperijn et al. 2010). In another representative survey, 95 percent of the respondents stated that green spaces were important to their health and well-being (NIPH 2007). Within the field of landscape architecture in which this study is situated, the term ‘green space’ refers to an environment in which vegetation and other natural features are dominant (Steg, Van den Berg & De Groot 2012). It may be a space in an urban area, such as a garden or park, or it may be more remote and pristine spaces, such as forests, grasslands, riverbanks, and beaches, which also include aspects of traditional blue spaces (Green Surge 2015). In everyday, nonacademic speech, the more general terms ‘nature’ and ‘natural environment’ are commonly used to describe these spaces. Despite the many health benefits of green spaces, not all population groups have equal access to them, as illustrated in a review of health inequalities in a British context (UCL 2014). One aspect of accessibility addressed by the British review is the distance to the nearest green space, which has been shown to be related to the frequency of visits (e.g., Neuvonen et al. 2007; Schipperijn et al. 2010) and health (Stigsdotter et al. 2010). Another aspect to consider is the accessibility of the space in relation to the individual’s abilities (WHO 2011). Both the distance to and the accessibility of green spaces may involve potential constraints that might exclude individuals from visiting them. A recent national Danish survey found that people with mobility disabilities visit green spaces much less frequently than the able-bodied population (Stigsdotter, Corazon & Ekholm 2017). These findings are in line with a nationwide survey on the use of outdoor environments for leisure conducted in the United States (Williams, Vogelsong & Cordell 2004). Furthermore, people restricted by physical disability generally have greater mental and physical health problems than the able-bodied population (Damgaard & Steffensen 2013; WHO 2011). One may, therefore, assume that the potential health benefits of contact with green spaces could be an important health resource for this population group. However, little is known about what factors lead to the generally low participation of people with mobility disabilities in green space activities. Studies have found that this group has the same preference for green spaces as the able-bodied reference group, shares the same environmental attitudes (Brown, Kaplan & Quaderer 1999; Lovelock 2010; Moore, Dattilo & Devine 1996), and gains the same health benefits. (Zhang et al. 2017). To provide equal access for all and to meet the requirements of the United Nation’s Convention on the Equal Rights of Persons with Disabilities (UN 2006), it is important to explore the constraints this population group experiences when visiting green spaces and how they can be overcome. The aim of the present study is to explore the experiences, preferences, and constraints of individuals with mobility disabilities when using green spaces. What value and meaning do the interviewees assign to their use of and experiences in green spaces? What constraints do the interviewees experience, and how do these affect their use of green spaces? How are the constraints negotiated, minimised, or overcome? The study is part of a larger research project that aims to design, construct, and evaluate a green space demonstration and research site adapted to increase the accessibility and potentially health-promoting experiences of people with mobility disabilities. The design of the green space will be based on health design, a branch of landscape architecture focusing on the design of health-promoting green spaces for different user groups (for more information on the evidence-based health design process see Stigsdotter 2015). The study took an interpretative phenomenological approach to gain insight into the lived experiences of individuals with mobility disabilities. Interpretative phenomenological analysis (IPA) is theoretically rooted in phenomenology and hermeneutics, and its strength lies in its capacity to identify meaning-making in peoples’ experiences within specific contexts (Smith, Flowers & Larkin 2009)—in this case, experiences of green spaces and the constraints related to them. Since IPA acknowledges that certain experiences are not confined to individuals, the analysis takes account of the collectively shared perspective, while paying heed to the distinctive (idiosyncratic) experience of a single person or subgroup (Smith et al. 2009). The analysis consisted of different steps ranging from the repeated reading of transcripts to note-taking and generating codes. This formed the basis for the identification of overarching themes and subthemes shared by the interviewees, as well as idiosyncratic themes (Smith et al. 2009). The analytic process was cyclical and involved a fluid, ongoing connection between source material and interpretation. Researcher triangulation was used throughout the analysis to maximize the validity of the findings (Creswell & Miller 2000). The phenomenologically grounded theory of what constitutes the experience of places, developed by the social geographer Edward Relph (1976, 1996), was integrated into the analysis to provide a deeper understanding of the interviewees’ relationship to green spaces, especially regarding their experiences of feeling included in a space or excluded from it. According to Relph, the notion of space can be understood as the experiential and spatial conceptualization of a place (Relph 1976). A central concept in Relph’s theory is how identity with or estrangement from a place is formed through experiences of either insideness (feelings of meaning, attachment, and involvement) or outsideness (feelings of separation and alienation) (Seamon & Sowers 2008). In accordance with this conceptualization, places not only bear the different identities awarded them by different individuals, but also these identities can change through time, just as people do (Seamon & Sowers 2008). According to Relph, the more profoundly one feels inside a place, the more strongly one will identify with it and feel at ease and at home there. These profound connections can be experienced as existential in relation to the strength of the identification with the space (Relph 1976). A place can further be experienced as authentic by having distinct or intrinsic features. Whereas the main feature of an inauthentic space is its generic, mass-produced feel, according to Relph, who describes how a lack of diversity and distinction can evoke a sense of placelessness (Relph 1976). The social geographer Yi-Fu Tuan provides an interesting perspective on the valuing of pristine green spaces (Tuan 2013), which can usefully supplement Relph’s concepts of inside- and outsideness. According to Tuan, our desire for pristine wild green spaces emerges from what he calls the polarized binaries (lived opposites) of feeling safe in our home environment (stability) and simultaneously craving places that are unreachable to us and which we also fear (adventure). Through such dynamic binaries we create romantic fantasies about what it would be like to conquer these ‘dangerous’ places (Tuan 2013). This perspective illustrates how our notions about pristine wild nature is partly generated by our own opposition to the routine security of the home environment. To understand and analyse the challenges faced by the interviewees, Crawford & Godbey’s categorization of constraints were integrated in the analysis. According to this system, constraints are faced and dealt with in a sequential order (Crawford & Godbey 1987; Godbey, Crawford & Shen, 2010), starting with the intrapersonal constraints related to the person’s preferences, aversions, fears, mental state, and so forth. These are followed by interpersonal constraints (e.g., the need for social support or an encounter with social discrimination). If those two constraints are overcome, the person may still encounter structural constraints that will prevent their participation. These relate to physical and environmental factors, such as transportation, the physical features and design of an environment, and the weather. The word ‘constraint’ emphasises that the causes of nonparticipation are not necessarily fixed barriers but issues that under the influence of personal, contextual, and relational factors can be negotiated and possibly overcome (White 2008). Recruitment was based on a purposive sampling approach (Etikan, Musa & Alkassim 2016), which entails identifying individuals within a segment of the population who were willing to participate and who had certain characteristics and experiences in common that were relevant to the study. The participants were recruited through two information meetings held in different parts of the country (Aarhus and Hoeje Taastrup), notice of which had been given through the Danish Association of the Physically Disabled and the Danish Disability Sport Information Centre. The aim was to secure a wide age range and gender parity, because previous research indicated that preferences and use of green spaces varied according to age and gender (Arnberger & Eder 2011; Conedera et al. 2015). Participants were not chosen according to their specific physical impairment but in relation to the physical constraints they experienced with respect to mobility. Mobility is defined as the ability to move one’s body from place to place in accordance with the International Classification of Functioning, Disability, and Health (ICF: section D: Activity and participation) developed by the World Health Organization (WHO 2007). The study was approved by the Danish Data Protection Agency (reg. no. 2015-57-0117). The interviewees received both verbal and written information about the aims and procedures of the study, and their written consent or that of their guardian was obtained before the interviewing process began. Data was collected in the spring of 2017 by means of group and individual interviews with people who experienced mobility disabilities. In total, six group interviews with two to five participants (N = 24) and three individual interviews were conducted (see Tables 1 and 2). 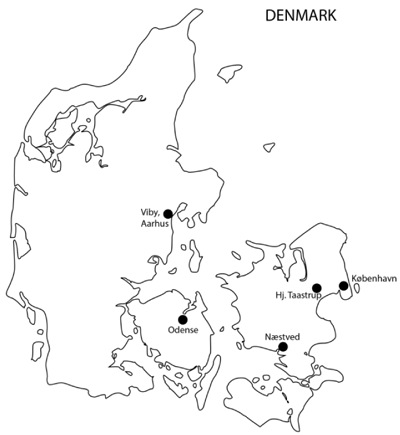 The interviews took place in different parts of Denmark to represent a broad geographical range within the nation. Schematic overview of the participants in the group interviews. The participants in the individual interviews. Note: The 12-year-old girl was supposed to be in the group interview but ended up in the individual interview as she was sick on the day of the group meeting. The group interviews took place indoors in public facilities and institutions accessible to individuals with mobility disabilities. See Table 1 and Figure 1 for an overview of the group interviews. The group interviews were semistructured with open-ended questions regarding use of, experiences in, and preferences for green spaces, as well as constraints encountered and strategies for overcoming them (see Appendix A: Interview guide). The exact wording of the questions was adapted by the interviewer according to age group and context. 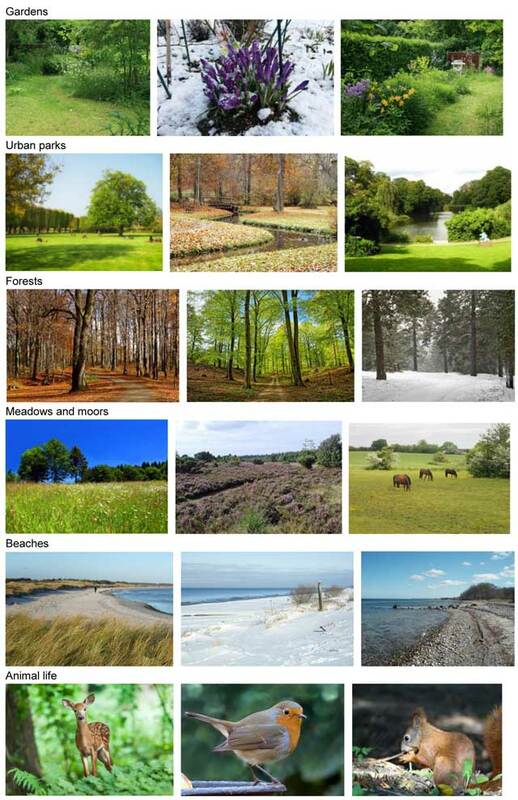 During the interviews, pictures of different Danish green spaces were placed on a table to stimulate discussion (see Figure 2), inspired by the method of photo elicitation in interviews (Harper 2002). Both the interviewer and the interviewees used the term ‘nature’ when they spoke about green spaces, as this is the common term used in relation to almost any green space in Nordic languages. Examples of pictures used in the group interviews. The individual interviewees were recruited from the interview groups. The interviews took place in a favourite local green space chosen by the interviewee (see Table 2), who guided the interviewer around the space during the conversation. 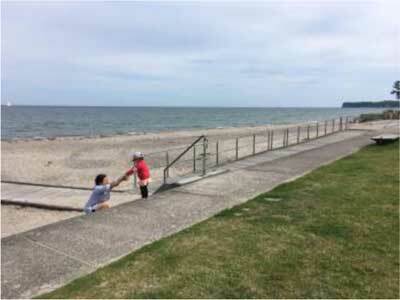 This ‘walk and talk’ interview method was chosen to capture the interviewees’ most common site-specific experiences (Kinley 2017). The interview lasted approximately an hour, was semistructured, and deployed the same questions as the group interviews, with an emphasis on the specific green space. Both group and individual interviews were included to saturate the data. The interviews were recorded and later transcribed by a research assistant. Analysis of the interviews revealed several overarching themes, as well as several subthemes (see Table 3). The most significant overarching theme was the attribution of value to green spaces, and its subthemes were according a hierarchy of value to the different green spaces, experiencing close physical contact with those spaces, and coping with the constraints involved in choosing a green space to visit. An idiosyncratic subtheme related to loss due to an increase in the impairment. A second overarching theme concerned the value attributed to the help and companionship of other people; a subtheme of this was seeing other people and—more personally—being stared at. The final overarching theme was that of the interviewees’ constraints and how to overcome them by making the inaccessible accessible. Overview of overarching themes, subthemes, and idiosyncratic themes. *The idiosyncratic themes refer to themes not shared by the majority of interviewees but evident among one or more interviewees. Generally, the interviewees assigned positive value to the concept of green spaces, regardless of their age and gender. They expressed this by linking their experiences of green spaces to positive feelings (e.g., ‘peace’, ‘freedom’, ‘joy’, ‘optimism’, ‘happiness’, ‘meditativeness’, and ‘relaxation’). One interviewee described visiting green spaces as ‘getting an energy boost’, another described it as receiving ‘balm for the spirit’. Several of the interviewees explicitly described how contact with green spaces enhanced their quality of life: ‘I simply love nature; you get refreshed in a different way’; ‘the joy of sitting in my garden and looking at the birds and the small flowers growing, it gives me a feeling of optimism’. Several of the interviewees also expressed their need to have regular contact with green spaces: ‘I just need to be in nature and touch it once in a while’. These narratives are in line with the Danish survey mentioned in the introduction, in which adult Danes reported that visiting green spaces was important to their quality of life. However, as the next section shows, not all green spaces were accorded the same value by the interviewees. The interviewees assigned a hierarchy of values to different green spaces and experiences. In general, the most pristine spaces were assigned the highest value, but they were also perceived as entailing the most constraints: ‘It is bittersweet to be so near to places that are far more beautiful than the ones I visit but to be unable to access them’. However, some of the interviewees also attributed the highest value to their own gardens or local parks. Those who attributed higher value to local, well-maintained green spaces linked this value to personal safety and/or social contact: ‘I am always a little bit afraid when I go out on my own; I feel a kind of nervousness or tension’ (an interviewee who preferred the local park in the city). By choosing a green space that was familiar and felt safe, the interviewee managed to avoid the potential intrapersonal constraint of fear. Because highly valued pristine green spaces presented the biggest physical challenges, they were, generally speaking, quite inaccessible to the interviewees. This is illustrated by the sentiment already quoted by one interviewee in the study title and echoed here by another: ‘I would really like to visit the forest, but it is just too difficult’. This yearning for pristine green spaces can be related to Tuan’s theory of longing for sublime landscapes, by which the very inaccessibility of a place makes one long for it all the more. This simultaneous valuing of and seclusion from pristine green spaces reinforced the feeling of exclusion expressed by the interviewees when they referred to their mobility disability. Some of their most positive and powerful narratives about green spaces related to experiencing a pristine green space that was made accessible to them without its naturalness being compromised. ‘It was an absolutely amazing experience’ said an interviewee who had crossed coastal vegetation and sand dunes thanks to wooden tracks in a Danish coastal national park. ‘There are small accessible paths, which take you away from the main path. You are led deeper in’. Cherishing pristine green spaces may also relate to Relph’s concept of authentic places, which have distinct or intrinsic features, as opposed to being generic and lacking in character. (Relph 1976). It should be mentioned, however, that Relph’s classification of the authentic extends beyond natural spaces to cover urban neighborhoods and cultural sites. Relph’s concept of inauthenticy seems borne out by the dislike the interviewees expressed for concrete paving in green spaces, which they perceived as diminishing the naturalness. ‘I get the illusion that I am on a path in the place, instead of on a road’ (by not using concrete paving on paths). Interviewees repeatedly mentioned close physical contact with the green space as being an important, high-value experience. This will be presented in more detail in the next section. The interviewees described how they sought and enjoyed close physical and sensory contact with the green space in question. They could achieve this if, for example, they could use tracks away from the main road, as illustrated in previous quotes, and if they could engage their senses by seeing, smelling, hearing, or touching vegetation, minerals, and fauna. They spoke of ‘the wonderful smell of trees’, ‘the smell of the forest when it is wet’, ‘watching the birds’, or ‘the sound of the waves’. The physicality of their interaction with the green space was a strong recurring narrative in most of their accounts. Unfortunately, deep immersion in green spaces was often hampered by the lack of physical accessibility. As one of the interviewees expressed it: ‘To be able to really get into the forest and just sit and listen to the birds—that is an experience many disabled people haven’t had, I think, because the paths don’t really go into the forest’. The positive feelings aroused by immersion in green spaces can be categorised as a physical aspect of inhabiting a space and, thereby, relate to Relph’s concept of insideness. Such insideness is evidenced in the above quote about being close to the forest floor and it being a life-giving experience. One of the interviewees, who was engaged in more adventure- and wilderness-oriented activities, described sleeping inside a redwood tree in California as one of his most precious green space experiences. Such an account shows how the concept of inhabiting nature can take on a literal dimension. By contrast, the lack of close physical contact with green spaces due to mobility disability fostered an opposite experience: one of outsideness and exclusion. Because of this, the interviewees took the constraints they anticipated into account when choosing a green space to visit. In general, the interviewees said that their choice of green space was a compromise between its accessibility with regard to the structural constraints it imposed on them and their preferences. ‘A big part of being in a forest is the experience of getting up close, but the paths in the forest are often too unstable for me, and I easily lose balance. That means I have to concentrate on just moving forward, and I use a lot of energy just looking down and keeping an eye on the path’ (from an interviewee’s account of why she seldom visits the forest even though it is her preferred green space). Several interviewees pointed out that the general lack of information about the accessibility of the space was a major structural constraint in itself. ‘I need information on where to go without getting stuck’; “in many places [webpages on green spaces], there is no information on accessibility, so I need to call and ask’. The remarks about accessibility largely centred on structural constraints with respect to the condition and surfacing of the paths. ‘It is important for us to find accessible paths without too many irregularities and bumps, to keep from losing balance’. The use of sand, pebbles, loose gravel, or grass reinforcement grids on paths made it very difficult to use a wheelchair or walker in pristine green spaces. Hindrances along the paths, such as steps, steep paths with no railings, and livestock barriers, were mentioned as major structural constraints to visiting green spaces. Lack of parking and toilets accessible for people with mobility disabilities were also mentioned as major constraints, especially by the elderly interviewees. The lack of information about physical accessibility and the related personal fear of encountering difficulties, getting hurt, becoming exhausted, or not being able to use a toilet meant that most interviewees chose to visit nearby green spaces with which they were familiar and where they felt safe. The structural constraints they encountered may be seen as fostering a sense of existential outsideness, as described in Relph’s work on modes of outsideness and insideness. Existential outsideness relates to the person becoming self-conscious and aware of his or her lack of ability to become physically involved in the space, which creates a feeling of alienation (Relph 1976). The insideness experienced by the interviewees in accessible green spaces may be categorized as an empathetic and existential insideness, based on their deliberate efforts to become involved with the place and their identification with it when it was accessible to them, which is illustrated in the quotes about ‘valuing nature’. Narratives of loss of contact with valued green spaces played a central role for the oldest interviewee group but were not shared by the other groups. ‘So much has been taken from me, I feel it now, I realize the loss’ (concerning visiting green spaces). The loss was related to a worsening of the mobility disability over the years and concerned both the ability to engage in physical activities and the visiting of certain green spaces. ‘It was part of my life to be in nature, so it was tough when it [the mobility disability] started’. ‘To walk along the shore and feel the wind and the sand, I miss nature a lot’. ‘I could walk right by the water’s edge among the stones, and I could walk for hours in the forest, all the way into the thicket, where there were no paths’. The loss created alienation and, thereby, an experience of outsideness, as illustrated in the quotes above. However, several of the interviewees in the group negotiated such constraints by changing their ways of inhabiting green spaces and visiting new spaces that were more accessible. ‘I can’t walk very far anymore, so now I have to sit down and gather impressions instead.’ ‘Before, I could cycle. Just jump on my bike and ride off. Out…. Down to the forest, different places. Now, I find other places, which gives me something—for example, the Japanese gardens. There, I can find peace, it is so beautiful to watch the different flowers bloom’. ‘Now I take the car; this also gives me freedom. It is just a different freedom. I can drive where I want to go, and then I can sit down and enjoy the scenery’. ‘We change the aim of the outings, so I still feel I experience some of the things, which can replace what I could do before’. The quotes show that by negotiating the loss, either by going to new places or trying new, more passive activities, the sense of joy could be regained to a certain extent. Another important aspect of overcoming constraints and being able to visit preferred green spaces related to the help and companionship of other people. These, however, carried their own risks of experiencing exclusion, which is described in the following theme. Assistance of others could also in some cases reinforce a sense of community and equality with those providing the assistance, as this quote from one of the younger interviewees demonstrates: ‘I can escape some of the constraints that my handicap imposes. It gives me the feeling of being equal to my helpers. We’re in it together, and we return home together, and that creates a sense of community’. The interviewee was a keen outdoor person and went camping and on longer hikes with his helpers, as well as on everyday trips. The longer hikes challenged him and his helpers in different ways, because the helpers had to push and, sometimes, carry him in his walker, and he had to endure being pushed around. Each in their different ways shared the hardship and triumphs of, say, climbing a hill. When they slept outside at a primitive campsite, the issue of mobility ability/disability did not interfere with their shared experience of sleeping under the open sky. Another interviewee was engaged in a social initiative known as team-twin. The concept of team-twin is that a group of able-bodied runners accompanies a group of individuals with mobility disabilities on tours in green spaces. The person with the mobility disability is seated in a lightweight assistive device, which is pushed by a runner. The interviewee described the experience as follows: ‘What I have gained from it [team-twin tours] is improved happiness and positivity. Both from being in nature and having companionship’. In the quote, the positive experience of feeling inside is related both to being in a green space and being together with other people. It should be mentioned that although the majority of the interviewees shared positive feelings about companionship when visiting green spaces, positive narratives of seeking solitude when visiting a green space were also expressed. The solitude was linked to having peaceful and meditative experiences. ‘Nature, to me, is relaxation. It gives me peace of mind. It puts me in a good mood’ (an interviewee’s experience of going alone to a green space). The mere presence of other people in a green space also seemed to involve a duality: it had the potential to enforce positive feelings, but it could also strengthen feelings of exclusion. For some of the interviewees the mere presence of other people on a visit to a green space fostered positive feelings: ‘To watch other people also enjoying it [being in a green space] gives you a kind of shared experience”. ‘I like having other people around. It creates a certain atmosphere. You can watch people talking and children playing. I enjoy this a lot. The energy from other people. It is the kind of thing that makes me want to go outside’. On the other hand, viewing other (able-bodied) people also seemed to carry the potential to elicit the feeling of exclusion: ‘You can see many people there, but I and other persons with disabilities are prevented from going there because the path is too difficult’. In these opposite experiences, the interpersonal dimension can be a potential constraint or a motivation to visit green spaces. As such, it can foster experiences of either insideness or outsideness. For two of the interviewees, it was a constraint that prevented them from visiting green spaces—a constraint that formed the idiosyncratic theme on being stared at. It [reasons for not visiting green spaces more often] is also because, often, for many of us, we are somehow different from the others. It is the way people look at you…. It really annoys me. I cannot stand being stared at. I don’t feel like being confronted with this. So I just stay at home. Then I do not have to put up with it. This constraint could be seen as either an intrapersonal or an interpersonal constraint, depending on whether it is the interviewee’s personal interpretation of how they are perceived or whether it relates to actual behavior by able-bodied persons. This constraint was not shared by younger interviewees, which indicates that age might have an influence on this particular intra/interpersonal constraint. The fact that this intra/interpersonal constraint prevented the interviewees from even going to green spaces with other people around (and thereby from encountering potential structural constraints) further provides support for the hierarchal structure of constraints proposed by Crawford & Godbey (1987), wherein first intrapersonal and then interpersonal constraints must be overcome before one can engage in an activity. As described in the theme ‘Valuing green spaces’, the experience of the pristine and close physical contact with green spaces was assigned a high value by the interviewees. The interviewees generally agreed that the naturalness of the space should not be compromised by making it more physically accessible: ‘There are many materials, such as certain types of gravel, that provide a hard surface and a natural look in nature’; ‘concerning signs, they can be made to blend into nature. I am not a fan of a lot of metal signs hanging around in nature’. Nevertheless, even though the interviewees put a lot of emphasis on maintaining naturalness, they still wanted improved accessibility in green spaces. ‘It’s a characteristic of nature that it’s not perfectly groomed, but it should still be accessible’. ‘Why is a handrail not aesthetic? Really! This word appears so often. I can feel I become angry. They want to work with accessibility, and then they will not do it, because no, it is not aesthetically pleasing’. This conflict between naturalness and accessibility was evident in several of the interviewee narratives. For example, one interviewee, who put a lot of emphasis on the pristine experience, stated later in the interview ‘the more appropriately a green space is designed, the less assistive devices are needed’. Several interviewees described design interventions that, though they were aimed at increasing accessibility, actually distanced them from a close physical contact with the green space, for example, by featuring broad concrete paths. As illustrated in the quotes above, they suggested that natural materials be used to maintain the authenticity of the space: ‘solid paths, but not asphalt, it has to look natural’. Moreover, the majority of the interviewees regarded regular maintenance and updated information on accessibility as a way to overcome some of the structural constraints related to visiting green spaces. ‘It is vital that the information on accessibility is kept up-to-date, but it seldom is.’ ‘You could easily make a little sign saying one kilometer to the next bench or something like that. Then, I have the option of deciding whether it is possible for me’. The emphasis on maintaining the natural experience of the green space was linked throughout the interviews to the interviewees’ positive feelings of being inside the space and the space being experienced as authentic and pristine. By contrast, some initiatives to make green spaces more accessible actually seemed to compromise this experience and, instead, led to separation and outsideness. This shows the importance of taking lived experience and user preferences into consideration when working to improve accessibility. The themes generally revealed a positive evaluation of experiences in green spaces, particularly those that brought the interviewees into close physical and sensory contact with the components of a space and highlighted its pristine qualities. Applying Relph’s conceptual inside/outside terminology to the interviewees’ experiences with green spaces provided a deeper understanding of how their meaning-making and valuing systems were constituted: The positive feelings related to accessible but still pristine places indicated that the interviewees had an experience of insideness. This experience could be seen as both emphatic and existential due to their desire to engage with those environments, the significance they applied to them, and their deep identification with them. Meanwhile a lack of access to green spaces created a feeling of separation, which can be understood as an existential outsideness created by the self-conscious and reflective awareness of noninvolvement. The interviewees valuing of serene green spaces is in line with research from the United States showing that people with mobility disabilities share the same environmental preferences as able-bodied respondents (Brown et al. 1999; Lovelock 2010; Moore et al. 1996). However, the US respondents with mobility disabilities differed from their able-bodied counterparts in their willingness to interfere with the naturalness of the space to increase their physical accessibility to it. In the present study, the interviewees suggested using natural materials and better maintenance to overcome the conflict between maintaining the naturalness of the space and the authentic experience and at the same time improving accessibility and inclusion. Accommodating this suggestion creates a challenge for the public administration of green spaces, because natural materials require more maintenance than concrete paths and iron railings. In the research on constraints in leisure activities within able-bodied populations, intrapersonal constraints have been found to be a major cause of nonparticipation (Godbey et al. 2010). This is not the case in our interviews, in which fear of personal safety was the only major shared intrapersonal constraint. The narratives on constraints were, instead, heavily focused on structural constraints. Similar results are found in a nationwide Australian study on participation in sport by people with mobility disabilities (Darcy, Lock & Taylor 2017). In our study, the intrapersonal constraint of fear for personal safety, in relation to an inability to cope with the unpredictability and inaccessibility of the space, was strongly related to the structural constraints with respect to, for example, lack of information and inadequate paving on paths. Therefore, this intrapersonal constraint might be overcome by structural changes. Altogether, the interviewees showed a high degree of negotiation flexibility in overcoming structural constraints by compromising between preferences and needs when choosing a green space to visit. However, the question remains as to whether all green spaces should be made accessible for all population groups or whether one of the inherent qualities of pristine green spaces is that the space is untouched by human intervention and difficult to reach. Maybe the collective longing for such spaces would be diminished if they were made more accessible considering the identity, value, and perceived desirability of pristine nature is, according to Tuan (2013), contingent on the difficulty of reaching them. There is no simple solution to this conflict between pristineness and accessibility, and any possible answers will vary according to the ethical, public health, and environmental preservation discourses involved. If public health and equal opportunities for all population groups are paramount, then improved access to green spaces will take top priority. But if environmental preservation is the overriding imperative, a higher value would be accorded to preserving the naturalness and untouched nature of the space. Similarly, when design interventions are imposed on a green space to increase accessibility for one population group, it can lead to the diminishment of that space’s value to another group. When designing interventions in existing greens spaces and planning new green spaces to accommodate the needs and preferences of people with mobility disabilities, it should be borne in mind that this is a diverse group with diverse preferences and needs. As the analysis shows, some interviewees preferred green spaces that gave them the option of being around other people or having companionship, while others found it stressful. Most interviewees ranked serenity highest, but some gave greater value to familiarity and proximity to home. According to research on constraint negotiation (White 2006), the motivation to participate is a vital factor when it comes to tackling constraints. This is probably also why the elderly interviewees who reported a sense of loss were generally able to overcome the relevant constraints: they were highly motivated to spend time in green spaces. While previous research on disability and accessibility has hitherto largely focused on structural accessibility (e.g., WHO 2011; Persson et al. 2015), the interviewees’ preference for immersion in green spaces highlights a dimension of accessibility which, to the author’s knowledge, has so far been unaddressed. The opportunity for physical immersion represents a form of multisensory accessibility. This insight, gained from the interviews, highlights the importance of heeding user perspectives and preferences when planning and designing accessible green spaces. Providing opportunities for close physical contact and sensory stimulation in green spaces is an aspect of health design. In the health design process, the user’s preferences, capacities, and needs are taken into account alongside current knowledge and research to design a space that is mentally, sensorially, and physically accessible for the particular user group and offers positive and potentially health promoting nature experiences (Stigsdotter 2015). Therefore, it might be fruitful to include this design approach when planning interventions in green spaces for people with mobility disabilities. The study’s qualitative approach made it possible to explore the complex interrelations between the interviewees and green spaces. The findings may be used in other contexts to the extent that the description of the interviewees, the settings, and the discourses are taken into consideration with a reasoned judgment about transferability (Flyvbjerg 2013; Guba & Lincoln 1982). In relation to transferability, the recruitment process might have imposed a potential limitation. Because it was a study on green spaces, one might expect the volunteers to include primarily people with an established interest in and positive attitude toward visiting such spaces. Therefore, the results should be seen as sample-dependent indications, which need to be tested in a larger representative sample, such as a national survey. Green spaces can be a health resource for people with mobility disabilities by stimulating positive emotions and providing valued experiences of insideness. Conversely, the lack of accessibility to green spaces may lead to negative experiences of exclusion and outsideness. The presence of other people for assistance and companionship or as a human backdrop can function either as a potential constraint or as a promotor of community experience. When working to increase the accessibility and positive experiences offered by green spaces, it is advisable to include the user group. Implementing evidence-based health design in the design of accessible green spaces could provide a design solution by which the healthful experiences of the spaces are promoted rather than compromised. We would like to thank all the participants in the interviews for their valuable contributions. This study was made possible with financial support from the Bevica Foundation (ref. no. 2015-7018), the 15 June Foundation (ref. no. 2015-A-66), the Danish Nature Agency (ref. no. 2015-7018), and the Danish Outdoor Council (ref. no. 104052). Brown, Terry, Rachel Kaplna, and Gail Quaderer. 1999. “Beyond accessibility: Preference for natural areas.” Therapeutic Recreation Journal 33(3): 209–221. Damgaard, Malene, Steffensen Tine, and Sten Bengtsson. 2013. “Hverdagsliv og levevilkår for mennesker med funktionsnedsættelse” (in Danish). The Danish National Centre for Social Research: Copenhagen. Green Surge. 2015. “A Typology of Urban Green Spaces. Ecosystem provisioning services and demands.” https://greensurge.eu/working-packages/wp3/files/D3.1_Typology_of_urban_green_spaces_1_.pdf/D3.1_Typology_of_urban_green_spaces_v2_.pdf. Guba, Egon G., and Yvonna S. Lincoln. 1982. “Epistemological and methodological bases of naturalistic inquiry.” Educational Technology Research and Development 30(4): 233–252. Hartig, Terry, Agnes E. van den Berg, Caorline M. Hagerhall, Marek Tomalak, Nicole Bauer, Ralf Hansmann, Ann Ojala, et al. 2011. “Health benefits of nature experiences: Psychological, cultural and social processes.” In: Forests, Trees and Human Health, Kjell Nilsson, Marcus Sangster, Christos Gallis, Terry Hartig, Sjerp de Vries, Klaus Seeland, and Jasper Schipperijn (eds. ), 127–168. Netherlands: Springer. Kinley, Penelope. 2017. “Walking interviews.” Social Research Update 67: 1–4. National Institute of Public Health. 2007. The national health report (chapter 26: Nature) (in Danish). Copenhagen: National Institute of Public Health. Retrieved from: http://www.si-folkesundhed.dk/upload/kap_26_naturen.pdf. Relph, Edward. 1976. Place and Placelessness. London: Pion. Relph, Edward. 1996. “Reflections on Place and Placelessness.” Environmental and Architectural Phenomenology Newsletter, 7(3): 14–16. Smith, Jonathan, Paul Flowers, and Michael Larkins. 2009. Interpretative Phenomenological Analysis: Theory, Method and Research. London, Sage Publications. Steg, Linda, Agnes E. van den Berg, and Judith Groot. 2012. Environmental Psychology: An Introduction. West Sussex: PBS Blackwell. Stigsdotter, Ulrika K. 2015. “Nature, health and design.” Alam Cipta 8(2): 89–96. Tuan, Yi-Fu. 2013. Romantic Geography. Madison (WI): University of Wisconsin Press. United Nations. 2006. “Convention on the Rights of Persons with Disabilities.” Available from: http://www.un.org/disabilities/documents/convention/convoptprot-e.pdf. Williams, Richard, Hans Vogelsong, Gary Green, and Ken Cordell. 2004. “Outdoor recreation participation of people with mobility disabilities: Selected results of the national survey of recreation and the environment.” Journal of Park and Recreation Administration, 2(2): 84–100. World Health Organization. 2007. “International Classification of Functioning, Disability and Health.” Geneva: WHO Press. Available from: http://www.who.int/classifications/icf/en/. World Health Organization. 2011. “World Report on Disability.” Available from: http://www.who.int/disabilities/world_report/2011/report.pdf. World Health Organization. 2016. 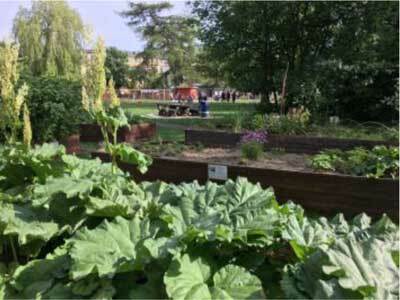 “Urban Green Spaces and Health—A Review of Evidence.” Copenhagen: WHO Regional Office for Europe. Available from: http://www.euro.who.int/__data/assets/pdf_file/0005/321971/Urban-green-spaces-and-health-review-evidence.pdf?ua=1.